June 20, 2015 – 6:30-9:30 pm – FREE! April 29, 2015 – 6:00 pm – FREE! April 19, 2015 – 9:00 & 11:00 am – FREE! N. Scott Robinson (world percussion) & Carnatic vocalist K.S. Resmi for church services. October 26, 2014 – 9:00 am – FREE! 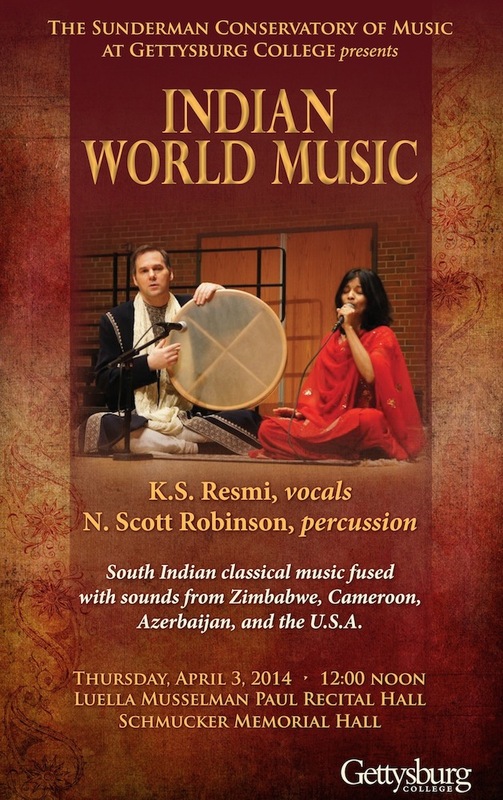 N. Scott Robinson (world percussion) & Carnatic vocalist K.S. Resmi for church service. N. Scott Robinson on percussion with guitarist George Svoboda and Carnatic vocalist K.S. Resmi. K.S. Resmi Annual Day Award Celebration with Kamalakiran Vinjamuri (violin) and Srikar Chittari (mridangam) accompanying student performances. Open to public – donations accepted. Carnatic vocalist K.S. Resmi with N. Scott Robinson on drumset & world percussion with Jaeryoung Lee (piano), James Romeo (saxophones, oboe), Bob Boss (electric guitar) & Bob Magnusson (acoustic bass) performing traditional & original jazz & world music. N. Scott Robinson (world percussion) & K.S. Resmi (Carnatic vocalist) in concert from 12-12:40 pm and visiting ethnomusicology classes from 1-4 pm. K.S. Resmi & N. Scott Robinson visiting world music class at Goucher College. Women’s History Month, San Diego Mesa College Music Dept., C-203 – FREE! Women in Music: N. Scott Robinson presentation on Women & Drumming in the Ancient World and K.S. Resmi presentation on Women in Carnatic Music. K.S. Resmi performing for Fringe Festival & Just Festival in Edinburgh, Scotland, UK. World Music at Towson 3 – K.S. Resmi Carnatic vocal concert with violin & mridangam (Rajna Swaminathan) with Kalin Kirilov & N. Scott Robinson opening with European folk music.